In a Britain ruled by magicians, Nathaniel is the apprentice to the unpopular and ineffective Arthur Underwood. Underwood routinely underestimates Nathaniel's true powers, and on one fateful day when Nathaniel is eleven, he allows the powerful magician Simon Lovelace to humiliate Nathaniel. Determined to have his revenge - and to prove his abilities - Nathaniel takes it upon himself to summon a djinn named Bartimaeus. 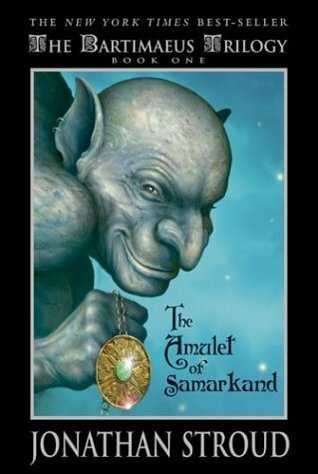 He sends Bartimaeus to steal the amulet of Samarkand from Simon Lovelace, and to hide it in his own master's study, hoping to get his revenge by embarrassing Lovelace. What Nathaniel does not realize, however, is the importance of the amulet, or the dangers of summoning a demon who might be able to learn his true name. Before long, Nathaniel's and Bartimaeus's fate are bound up together, and there is a good chance neither of them will survive what is to come. This is a very long book, and it took me a very long time to read (two weeks) compared to the 2-3 hours it usually takes me to read a middle grade or YA novel. The point of view shifts back and forth between Bartimaeus, whose witty first-person narration includes lots of references to historical events and footnotes on nearly every page, and Nathaniel, whose chapters are told in the third person. There is a lot of information to take in about the world of this story - alternate history, the complex procedures for summoning demons, the different types of demons and their different powers, the rules for naming wizards, etc. - but I didn't have trouble catching on. Everything is well-established and revealed as needed in the text. From a purely structural standpoint, the book is solid, and the characters are interesting, even if they are not likable. Overall, as an adult reader, I found this book compelling, and I think a child with a well-formed conscience could read it and take something away from it without his own sense of morality being affected. Still, I don't see this at all as a Harry Potter read-alike, and I would not feel comfortable giving it to readers under age 16. Interesting. I'm usually bothered when I can't find the "good" side in a book (Artemis Fowl), but I don't remember having that problem with this one. Only my really high fantasy readers even pick this up, and they're pretty mature. In theory I should reread this but... probably not going to happen. As for playing with pentacles, I remember repeatedly checking out a book of "magic spells" from the public library, and none of them ever worked. I wish I could remember the name of that book, since it took itself pretty seriously! Thanks for your view on this.